While India is perhaps most closely associated with gigantic mountains and wide rivers, it's also home to one of the world's largest deserts. 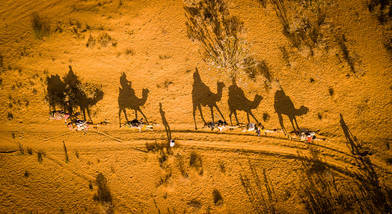 The Thar Desert, sometimes known as the Great Indian Desert, covers 200k square km (just over 75k square mi. ), most of which is in the northwestern Indian state of Rajasthan. It's one of the world's top 20 deserts in area, and the most populated. In this video, you'll get an aerial tour of this magnificent desert, compliements of contributor Miapvideos. Description: India adventure trip in desert. All the drone shots were actually made while driving the camel including take off and landing....something I havent done before:) Sleeping under the stars in the desert was really pleasant experience and one of the highlights while traveling in India.